Five years back when I was hard broke, had nothing to do as I left my 9-5 job and literally without savings, I met with a friend who works online and he taught me how to do freelancing work online with no experience & money. I literally thought it was hard to start as a fresher however it was pretty easy. 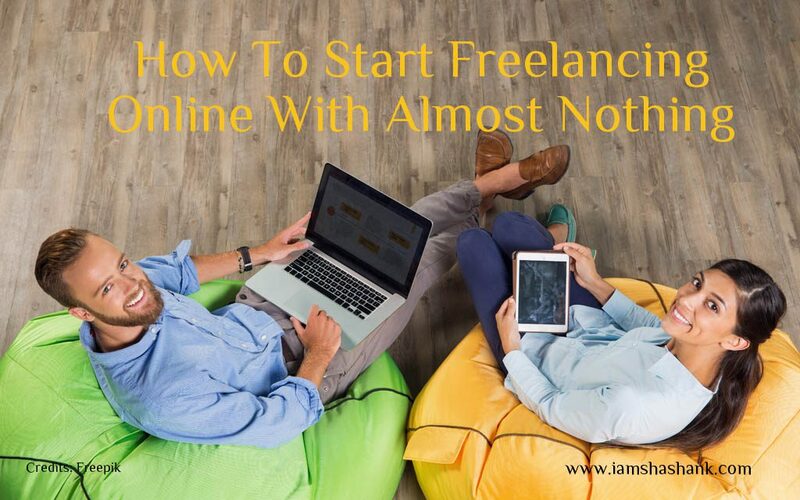 If you are reading this means you are here to earn great & learn how to work freelance in home. I will teach you step by step as how to start freelancing with no experience using a laptop & internet connection only. You will also learn how to get project from freelancer website and all the tips are especially based on Freelancer website i personally applied and got so many projects over time. It just needs your dedication and time. That’s it! Many websites out there online which provides work from across the world and just takes a cut from the work you will do for your clients online. Joining these websites is completely free and you can upgrade your accounts as per their plan once you start making money to attract more money. And many others are available on internet with just a simple search. A pro tip from my side; try to focus on 1-3 websites at a time because consistency is most important asset and to grab more projects and make your clients happy, you have to deliver quality over quantity. You can charge as low as $5 when you start freelance work on Fiverr especially then, you can start to raise your price once you taste some experience. Focus on how a freelancer get jobs on these sites or you may also hire someone to make you learn the pros and cons. Once learned, you are ready to earn. There are no limits. The main recipe to earn fast is by spending as much time as you can and patience is going to be your best friend. You don’t have time. Really! Then make some time, don’t watch some TV serials or daily broadcast movies. Try scrolling less news feed of your Facebook and Twitter accounts and make room for extra 1-2 hours daily if you really want to learn how to earn extra income. Ask yourself, you can find your free time. Anybody can. Right! If you know how to design graphics, start adding design category to find freelance work as I do. Do Online Form Filling jobs without investment using SwagBucks Referral System where you can do some genuine Form filling and survey jobs and can earn shopping coupons or Paypal Coupons that can be en cashed to your bank account for real money. You can also be a Virtual assistant if you are soft spoken and can handle customers on call, chat, email etc. Hope you get the point! You can also do Content Writing Jobs and can get paid everyday basis. Content writing is easy and you just need to learn basics of Keywords, Writing methods and how to use them in article. You can learn all this by joining my Free Facebook Digital Marketing Community with 3500+ members and growing everyday. Say Hi once you join. Once you decided to start based on your niche, make sure to prepare a best portfolio that can help you land more clients fast. I know your question. You are starting out then how could you have a portfolio then. Starts focusing on Contests and you’ll learn how to use freelancer to make money. This help you compete with world and shows you your exact position and help you see other best ideas to grow naturally. Don’t feel down if client rejects your design. It’s just everybody have different taste. When you start freelance work, you can learn from people competing as how they manage to land more clients, how they understand and satisfy them. This will help you to prepare your portfolio fast. Then choose the best among them and display on your profile. In order to get the most out of your portfolio, share it with friends and colleagues on Social media websites like Facebook, Twitter, and LinkedIn. You may land more clients who might be looking for freelancers like you and may solve the puzzle of how to do freelancing and earn more money. This is the need of the hour. If you want to get hired again and again, you should start delivering values. Try to make every customer happy and submit great work so that your customer can hire to frequently to earn more business. Also get great reviews for the completed tasks. Every freelancing website has a review and rating system, wherein you and prospective employer both can rate each other for their work and behavior. This helps in maintaining standards for the website and their users both to avoid any issues whatsoever. Now after earning, you want to know what next? Well every business needs expansion and a proper planning to grow further. It sounds tough but it’s easy! Start your own agency based on your niche. Hire more people full time or part time freelancers like you do. Here in you don’t have to give freelance websites a cut. You can work separately and can do marketing on your own to get more high paying clients. Always remember to invest at least 30% in marketing spends to grow at a good pace that your new business desires. You can market your business for free as well online by these methods. The next step can be finding jobs to providing jobs once you start to get enough work to handle. Take a leap and enjoy growing later and ever after. I found success on Freelancer Website. Where did you get most success? Write in comments below. Add more sites for users who really need your help to start their freelance work career. Add more points to get success handy and quick in comments section. Keep going and have patience! Thbks a lot sir ,this article is really informative …. I am glad you loved it. Thanks! Your blog can go viral. You need initial boost only. How to get it?